There will be a limitation on the number of entries for this years event, so make sure you register early and reserve your spot. With the addition of a 100 mile distance (full century) this year’s event promises to be our best one yet. Go to our registration page and register either online or download the entry form and get it mailed off right away. We will be making some exciting announcements in the upcoming weeks, so make sure you check back with the site or follow us on Facebook and Twitter. You’ll need a way too carry water and/or sports drink on your rides. This is crucial to your heath, performance and safety. The most common methods are water bottles or a hydration backpack. Both work very well. Before each ride, you’ll need a way to check and add air pressure to your tires. Tires with low air pressure are more difficult to ride and steer and are more susceptible to punctures. Even if you keep your tires inflated to the recommended pressures, punctures can happen out on the road. You’ll need the tools and the knowledge to be able to change a flat tire by yourself, just in case. Don’t worry, it’s not nearly as difficult as it sounds, and most bike shops have hands on classes that teach this necessary skill. In order of importance, protection is the most crucial of the HIPP essentials. A bike helmet is required for the Tour de Summerlin and should be the one accessory you never leave home without. After protecting your head, the next most important area to protect should be covered by a pair of good cycling shorts. Cycling shorts, with a padded chamois insert are designed to be worn next to the skin, (read-no underwear!) to prevent chafing and sore spots. This is also the reason they are tight. Moving fabric is abrasive fabric over 100 miles. If you are uncomfortable with the tight fitting look, there are skirts and baggy shorts that go over the skin tight fabrics for a functional, yet more casual appearance. After a helmet and shorts, sports eyewear and gloves are probably the next two items in line. Once you have taken care of hydration, inflation and protection, you can look to additional performance items. Cycling shoes have stiffer soles and can attach directly to your pedals. This can be a very welcome performance addition if you suffer from sore feet. Beyond that, a cycling jersey features pockets on the back to carry food and essentials. When searching for the right accessories, you’ll make at least one trip to the local bike shop (preferably McGhies Ski, Bike & Board). 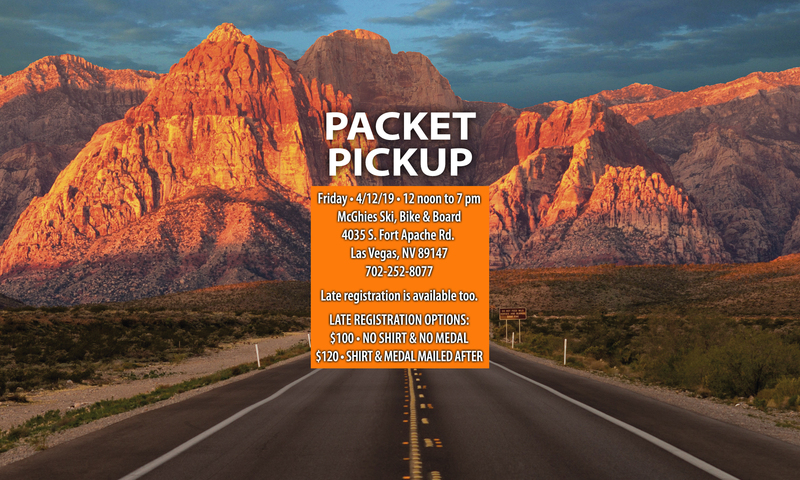 This is the perfect opportunity to have your bike inspected and tuned for the big ride, and all the training rides that will precede the Tour de Summerlin. Do this now, before the summer rush at the shop. Let the shop professionals know that you’ll be riding 100 miles and you want to be sure your bike is ready. It’s the perfect time to inspect tires, bar tape, saddle condition and shifting performance. It would also be a great idea to ask for their opinion on your riding position and their advice on any body parts that may be bothering you. Saddle height, saddle angle, bar position, and brake lever position are all easily changed and very important to making any rider comfortable. Once your clothing and equipment are in order, its time to work on building an aerobic and muscle base that can get you all the way to your 100 mile goal. The key here is to start slow, with attainable goals that make it obvious for you, mentally and physically, that you can do the whole thing. A sample Preparation Plan is as follows. This starts 8 weeks prior to the event, somewhere in early to mid February. The idea is to start with easily completed rides and varied paces. By varying your pace, some days you’ll push your body, other day’s you’ll be out to rest. An important part of training is recovery and your easy rides are a way to loosen, but not tax your muscles. The chart below is in miles. If you miss a day, don’t worry too much. The closer you get to April 21st, the more important the rides. This is not set in stone, but it is a good plan that would make you ready to ride. We hope that you all are excited as we are for this year’s 11th annual Tour de Summerlin, which will be held on April 21, 2012. With less than a month away, all of us here at Tour de Summerlin want to give special thanks and recognition to our sponsor, Red Rock Casino, Resort & Spa. In celebration of our 11th annual Tour de Summerlin and in appreciation to all our riders over the last 10 years, Red Rock Casino is helping us do something special this year by hosting both the start and finish line at their property. In addition, they will also be hosting our post-ride luncheon, where we can enjoy our feelings of pride and accomplishment together. We are incredibly honored and thrilled to have one of Las Vegas’ most impressive resorts join our wonderful group of sponsors. In addition, we’d also like to thank the following sponsors for their generous support. This event would not be possible without them: Summerlin, Howard Hughes Corporation, McGhies Ski, Bike & Board, TeamAMC, Trader Joes, and Land Rover Las Vegas. For more information or to register online, please visit www.tourdesummerlin.com.